In Bærum Kommune, at the top of the Lindelia hill overlooking Oslofjorden, Backe Stor-Oslo began construction on an energy neutral, innovative centre for mental health and substance use care, Lindelia BBS. Last Friday, Imerso joined their team on-site to learn about the project and kickoff their use of our monitoring platform - along with a few inaugural laser scans of the site together with Backe’s team. The Backe offices at Lindelia are at the top of the hill, looking out over the construction site. We didn’t get to check out the terrace view (we’ll have to find an excuse during our next visit), but the view out the office windows just one floor down, was fantastic! The Lindelia centre will consist of three distinct buildings, totalling 15.100kvm. The main centre will house 132 rooms for rehabilitation; in addition, there are two apartment buildings with 12 apartments between them. These are the goals that drove Backe into a collaboration with Imerso. To make sure they can deliver a project BIM-as-built, with no costly, schedule-stretching mistakes, Backe is employing a lean construction methodology and exploring digital methods at every turn. The team is all engaged and up-to-speed on the possibilities afforded by digital solutions - Jon Roald Johnsen, the teams BIM coordinator, seemed especially excited to explore new tools and more efficient workflows. As we go down to the work-site to do the inaugural laser scan - LEICA BLK360 in hand - Jon Roald and our CEO Frederico are discussing drones. 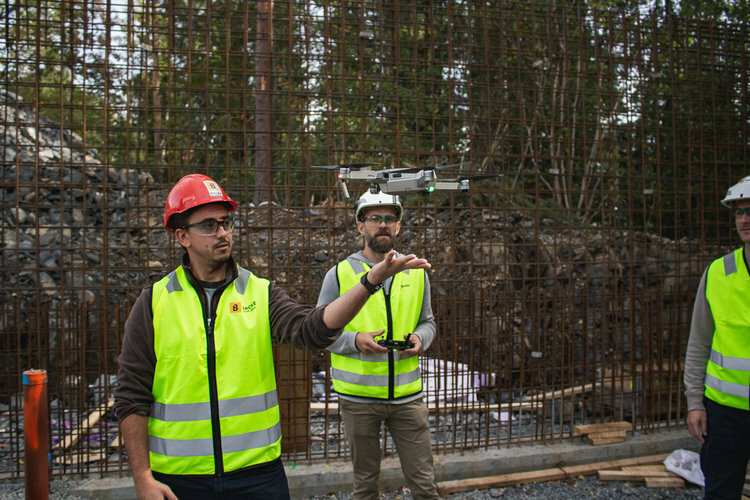 They both use a DJI Mavic Pro; Backe is testing it for aerial documentation and 3D mapping the worksite into our platform. 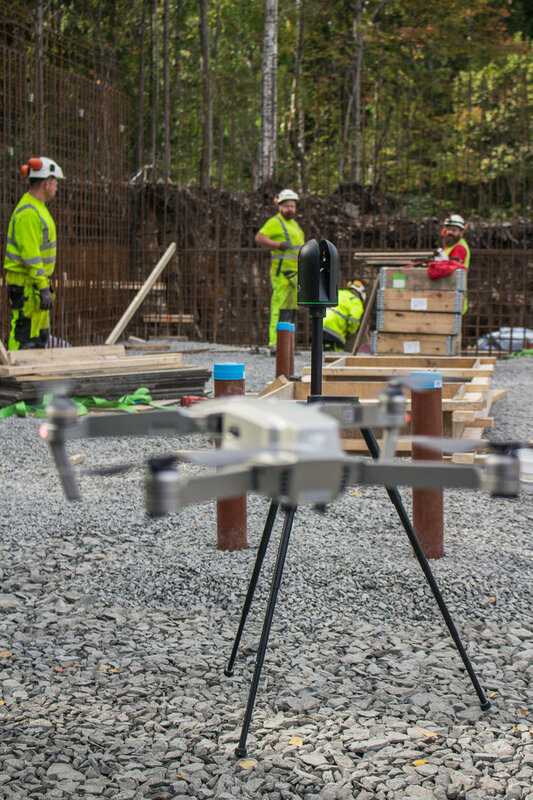 Standing out as a digital leader: Drones for aerial overview, Imerso’s mobile scanner app for quick-and-easy field checks, Leica’s BLK360 laser scans for systematic millimetre-precision As-Built checks - all processed against the building plans on the Imerso platform. These are some of the strategies that Backe’s team is exploring in this project for making its ambitious goals a new standard! We all gather in what will be one of the Lindelia basements, as Jon Roald demonstrates how they use the drone to capture data. As we stand there discussing, the BLK360’s single button is casually pressed, and the scanner gathers some high-accuracy 3D data in minutes while we chat. A beep is heard when the scanning is done, and we move to a different spot. We work with the drone and scanner (while Imerso’s over-eager photographer snaps pictures) for an hour or so, capturing loads of great data, but finally wrap up the exciting first day of a new collaboration. As we make our way back up to the barracks to leave our hardhats behind, Martin Hoberg gives us a final tour of the worksite. The teams are already hard at work, and we look forward to follow their progress throughout the construction phase. Backe’s sense of the urgency and the commitment to reap the benefits of going digital is palpable. The goal of 0 mistakes seems pretty much impossible given the complexity of any typical large construction site, no matter what team is in charge. But after a whole day of tech talk, discussions on challenges and strategies, and testing these new tools with Jon Roald and his project management team, it seems that if anyone will arrive at those goals, it’s Backe’s team at Lindelia. Stay tuned for new updates on our progress in this exciting new collaboration.